Over the past several month's I've actually gotten really into the "adult coloring" books. I have acquired quite a few of them and like kids do picked my favorites. To me it's something that doesn't really take any thought so I can just do it and relax. No expectations, and no worrying I'm going to do it wrong. So of course when I saw Oriental Trading was going to have a coloring contest I new I'd have to enter myself - and of course share all about it! 1. Download. Choose from three original coloring pages. Download your favorite! 2. Color. Use pencils, markers, paints – whatever it takes to express yourself. 3. Snap & Share. Snap a pic of your finished coloring page and share it to Instagram. 5. Win. We’ll announce the Grand Prize winner plus 5 runners-up on February 15th. What are you waiting for? 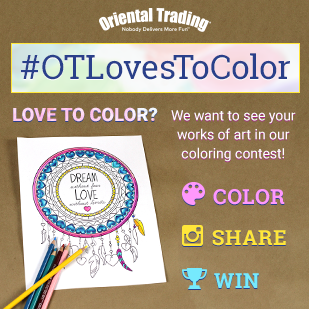 Visit http://www.orientaltrading.com/s3-otlovestocolor.fltr to download your coloring page and get started with your colorful creation now! ** Grand Prize is a $200 gift certificate to Oriental Trading, a 12-piece set of PolyChromos Colored Pencils, a mini marker set and four Oriental Trading Coloring books. Runners-up will each receive a $50 dollar gift certificate, a 12-piece set of PolyChromos Colored Pencils, a mini marker set and one coloring book. I don't know about you, but I'm super excited about this contest. I'll be sure to share with everyone once my page is done so be sure to follow me on Instagram! I'm into adult coloring books too and find it to be a very relaxing hobby. I've seen the works of others, and they are super talented. I doubt I enter this contest, but may share it with others who would be interested. Thanks for sharing! I'm going to enter just for the fun of it.